The majority of the world population lives in urban areas. Although cities are a source of environmental pressure, they serve as centers for innovations as well. The innovation potential accumulated in cities increases chances for meeting the needs of their inhabitants whilst respecting the demands and limited capabilities of natural environment. 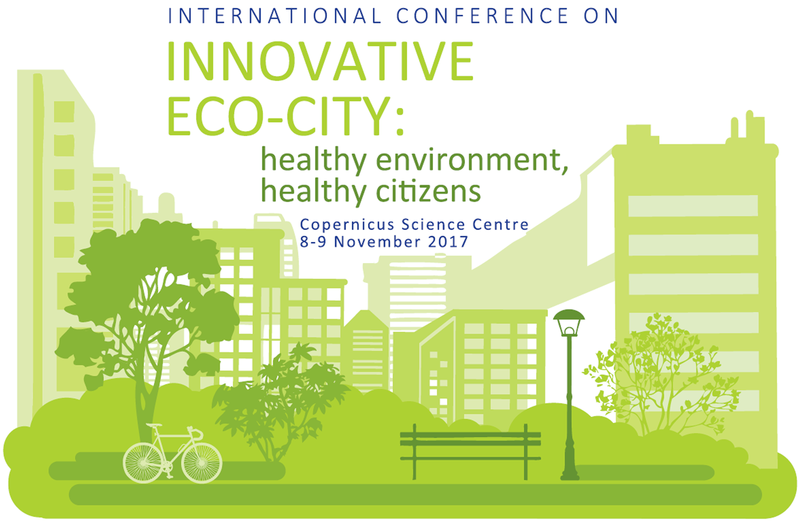 The INNOVATIVE ECO-CITY conference is a two-day international event gathering experts in the field of sustainable development and innovative technologies, representatives of administrative authorities engaged in the process of socio-economic transformation in the urban area, representatives of international agencies and numerous Polish and foreign city councils, as well as business delegates. The conference provides forum for showcasing latest research and best urban practices, and for exchanging experiences between guests, allowing for an identification of developmental trajectories for the cities that would be optimal for both city inhabitants and natural environment. WHY HEALTHY ENVIRONMENT = HEALTHY PEOPLE? Rates of the population residing in urban areas continue to rise in Poland. This tendency is consistent with a global trend. The dynamism of cities’ growth has been underrepresented in previous considerations that regarded our wellbeing and its increasing pressure on natural environment. Hence, the challenges of sustainable cities have become a critical issue discussed in the most recent documents that define strategies for the world. The UN 2030 Agenda for Sustainable Development (2015), as well, as the EU Urban Agenda (2016) acknowledge that cities will play a key role in achieving sustainable development on the global scale. The concept of healthy cities, green cities, and sustainable cities focus on holistic approaches, that include political commitment, institutional change, capacity building, partnership-based planning, and innovative projects for improving urban environments and population health. In the latter approach, an active involvement of citizens in the decision making process is considered essential for these projects’ outcomes. We will attempt to identify key challenges associated with the sustainable urban development. We will also discuss benefits stemming from an application of innovative ideas and technologies in order to meet the growing needs of city inhabitants. Finally, we will address the role of active citizen participation in shaping the genuinely intelligent and sustainable city with the use of modern technology. natural resources consumption in the urban areas and its effect on the resource economy. The UNEP/GRID-Warsaw Centre was established 26 years ago as a member of the Global Resource Information Database (GRID) network developed by the United Nations Environment Programme (UNEP) for fostering sustainable management of natural resources, thus a promotion of sustainable development is one of the key statutory goals of the Centre. The Innovative Cities conference is being organised within a framework of the "Together for the Environment" Partnership, an initiative for common implementation of environment-related sustainable development goals. The Centre, officially registered as an NGO, is a branch of the National Foundation for the Environmental Protection. Warsaw is the capital and the largest city of Poland with population of 1.7 million. Warsaw is the political, economic, academic and cultural centre of the country. The CITY OF WARSAW has signed the Covenant of Mayors in 2009 and submitted the Sustainable Energy Action Plan in 2011. In the SEAP Warsaw committed to the target of 20 % reduction of CO2 emissions by 2020 compared to 2007. The continuation of the SEAP is the Low-Carbon Economy Plan. The budget of the City of Warsaw for 2017 alone includes 2 billion PLN to be allocated for environment protection, 1.1 billion out of which is allocated to air protection. Projects implemented through this financing include, inter alia, the construction (extension) of the second metro line and new tram lines, the purchase of low-carbon public transport fleet, the development of cycling infrastructure, connecting municipal buildings to the district heating and summer street cleaning. The ECO-MIASTO project is being organised for the fifth time this year. The project involves a range of events including the Poland-wide competition for municipalities, a conference on environmental sustainability, and a number of associated activities, such as seminars and meetings for sharing best practices. The ECO-MIASTO Competition aims at promoting environmental sustainability by awarding those among large and small-sized municipalities in Poland, which are leaders in environmentally responsible sustainable development.